A gorgeous gift for a new baby, born on a Monday. This solid oak frame is laser engraved with “Monday's child is fair of face”. It features a cute stork flying through the night sky, surrounded by stars. 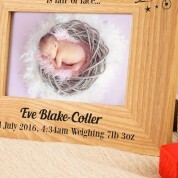 We include the baby's full name and your own choice of message, which will be displayed at the bottom of the frame. We think this would make an excellent new born or Christening gift for a girl or a boy, and will be stunning displayed anywhere in the house, especially the nursery. The chunky landscape frame holds a 4 x 6 inch photo. All engraving, design and personalisation is done in house for a truly unique finish. Because of the natural grain of the wood, all frames will vary in colour. A special keepsake to cherish for years to come.